“We’re getting close to the fight, and I feel good. This fight is personal because of all that’s been said, and it will be difficult to regain the respect that we once had. The statements that have been made about me have given me more motivation to train harder. I have watched the first fight several times. The error that I made was that I had opportunities to counter that I needed to have taken advantage of. I need to do that in the rematch. Golovkin knows who I am. He knows who I’m about. Let me put it even better–he still doesn’t know how much more I have left to show. I’m looking forward to showing him that on September 15. I have to win convincingly. It has to be a knockout to erase any doubts. I’m very motivated for this win. I’m confident, but not overconfident about my opponent because I know who he is, but I’m confident in my preparation. There is no such thing as a Mexican style. There have been many fighters from Mexico with different styles. My style is mine. I’m Mexican and that’s what is important. 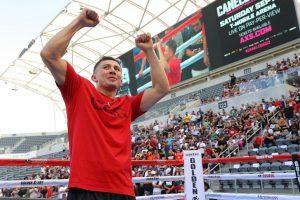 Maybe Golovkin uses ‘Mexican Style’ to get fans, but he’s a hypocrite. If something were to happen in Mexico, he wouldn’t be there to support them. “Canelo, he is not a champion. He is a liar who has no respect for the sport of boxing or its fans. I want to stay world champion and bring all my belts home. I am ready to star in another Big Drama Show. I do not think about Canelo in training. I am not worried about him. I only worry about doing my job in training camp and doing my job in the ring against Canelo on September 15. 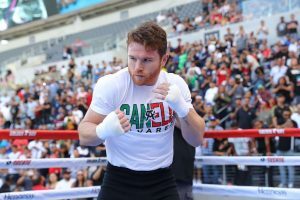 In the last fight I did not feel any real power from Canelo. Just slaps. He is not the hardest puncher I have fought, but he is fast and quick. He is the most skilled fighter I have fought. He is a very good fighter. I am happy to get at Canelo again. It is another big chance to beat him again. Of course I want to knock out Canelo. It would be nice if Canelo came to fight this time. I don’t believe what he says about how he will fight me this time. He said the same thing before our first fight. I will definitely be more aggressive in this fight. not feel anger toward him because the rematch was canceled the first time. “Fighting on this card is a great opportunity, especially on a date that is so important for Mexicans. I have the obligation to give a great fight to all the fans. I know Brandon Cook is a tough opponent. He is older than me and has a lot of experience. But I think I’m stronger than him and have a reach advantage. I’m confident I’ll walk away with my hand raised. This fight is an obligation to come in even better than last time. I need to show that I’ve gotten a lot better. I never knew that I would get so far in my career so quickly, but things happen for a reason. The Liam Smith fight gave me a lot of experience. It showed me all the errors I made that I am now working on in the gym. “This is the biggest fight, the biggest boxing event of the year. The two best middleweights going mano a mano for all the marbles. Gennady is going for the all-time consecutive title defense record to further burnish his place as the top pound for pound fighter of his era.